Capriccio showing a bird's-eye view of a circular vaulted hall with a central round pier and two tiers of colonnade. This is possibly surrounded by water crossed by bridges to a tiered platform with niches and screens behind. 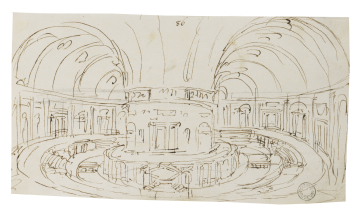 You are here: CollectionsOnline / Capriccio showing a bird's-eye view of a circular vaulted hall with a central round pier and two tiers of colonnade. This is possibly surrounded by water crossed by bridges to a tiered platform with niches and screens behind. The two related drawings in Adam vol.55/79 and 80 may show details of the curved exterior walls of this composition. The use of the bird's-eye technique, relatively rare in Robert Adam's work, is also found in Adam vol.55/43 and 47. The composition of the round central pier and radiating vaulting is also in Robert Adam's picturesque inventions of the late 1770s. The building here may have been inspired by the circular underground hall of the Palazzo Farnese at Caprarola, which Adam visited in September 1755 (see J. Fleming, Robert Adam and His Circle in Edinburgh & Rome, London, 1962, p.180).